Ian Ludlow is an author. He writes thrillers and he is pretty good at it. His successful creation, Clint Straker, is the epitome of the macho action-hero who dashes into buildings to save distressed damsels and who unhesitatingly nemesis-es arch-villains and then with one foot on the back of the neck of the fallen bad guy pulls the gratefully rescued, invariably scantily clad, female for an embrace and a well deserved kiss, prelude to stronger thanking later. Of course, that is Straker the hero. It is not Ludlow the writer. When we first meet Ludlow the writer, he is on a book tour having recently accidentally blown up his own house. Straker is a spy-for-hire in the prime of his life and physical condition. Ludlow had "the soft body of someone whose idea of exercise was walking into McDonald's rather than using the drive-through". Straker can fight two bad guys at the same time and barely break a sweat. Ludlow broke his arm falling off his bike (lot more to that story, though). The important take from all that is that Ludlow is a very successful author of thrillers and television shows (including a cop show about a detective plant) and is not a spy. He doesn't want to be a spy. He has no fantasy about living Straker's life. He is down to earth and normal and realistic. And that is why is so interesting when he suddenly has to work in Straker's line of business because very powerful people in the cloak and dagger community want him dead, not because he saw something but because he thought something. Which makes some sense when you consider the fact that authors of thrillers really should make their plots possible and Ludlow did just that - but a little too well. To help see the difference between the real life of this author and his fictional creation, we the readers are treated to snippets from some of the Straker universe. This includes the time Straker's love making to a Russian female agent is so good she is put into a coma for days. Totally unrealistic, of course, but it does show the kind of spy novels Ludlow writes and it really shows the difference between the two worlds. Straker is the ultimate lover. Ludlow is not so much. Joining Ludlow in his endeavor to stay alive is Margo. Margo's life before she had the misfortune to be paired with Ludlow was as a part-time dog-walker and part-time author-herder (she shepherds authors on tour to the right book signings and the like). Both jobs, to her, have a lot of similarities especially cleaning up the messes both species tend to make. She is less than pleased, with good reason, to be thrown into the trouble that follows Ludlow but considering how she comes through for him more than once, Ludlow is very lucky she is there. The crashing of the passenger plane onto a beach in Hawaii was no accident according to thriller writer Ian Ludlow. Many years before, the CIA had hired him to envision terrorist scenarios and this was one he had come up with. Now that knowledge makes him far too dangerous to let live. 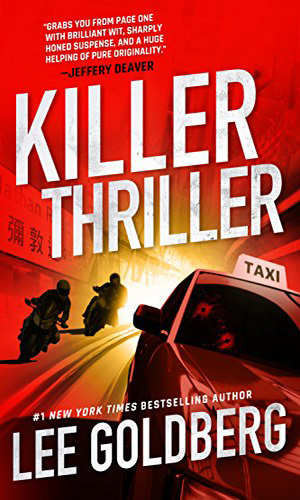 When Ian Ludlow and his lovely assistant Margo head to Hong Kong to research his latest thriller, a book detailing a huge Chinese conspiracy to take down the U.S., they had no idea that trouble they were getting into. The plot was actually happening and the plotters did not want it revealed. I read so many dour, grey, dreary spy novels where everyone distrusts everyone and nothing good ever happens and everybody loses. I love 'em but often I need something a tad less depressing and when I find a series that is not only a whole lot less mood-killer but is also exciting and well-written and even a good deal thought-provoking, I revel in it. Picture me reveling now with the new Ian Ludlow series. "As a chronicler of spy series, when I find a book that I love that is not yet a series, I get grouchy. Darn it all, I want to write about it and can't 'cause it doesn't fit my website. 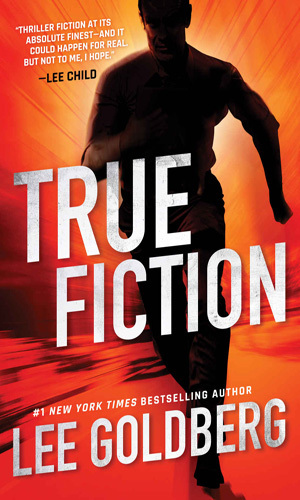 That is what happened with True Fiction, a book I devoured hungrily last year. Then I saw another was coming so I could have my wish. I just had to wait. (I am not good at waiting. Patience is overrated). "Now I have the second in the series and in a day or two, when I have savored the rest of this book, I will gladly add it to my site because I really, really enjoy the character of Ian Ludlow and the trouble that gets thrown his way and I adore Margo who not only can save the day now and then but has the wit and sharp tongue to put Ludlow in his place when needed. "The writing of this adventure is as smooth and creamy as the first, allowing the story to flow easily and lets the characters do their things. Dialogue is clever and realistic and, luckily for us, does not bog down (no long diatribes to weary the soul). Action is aplenty and highly enjoyable with just enough blow-em-ups to keep me happy. "I have been a Lee Goldberg fan for some time now and will continue to be as long as he keeps writing. Hopefully, more of that writing will be about Ian Ludlow." One final note. Back in the 80s I bought and read and still have in my book collection a couple of "men's adventure novels" titled the ".357 Vigilante". They were penned by Ian Ludlow. I did not know until recently that that was a penname of a starting author, Lee Goldberg. Now he has written this new spy series about an author of action adventures who gets thrown into all sorts of spy related events, none of his own choosing. He wonderfully chose to name his fictional author "Ian Ludlow". I love it!